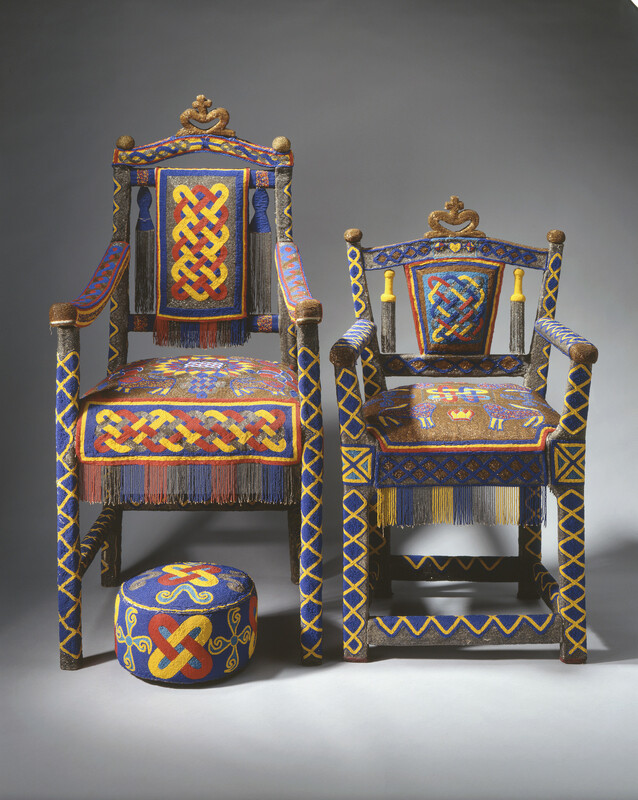 Two tall wooden Yoruba thrones with straight backs, the arms and legs with three stretchers, and sprung seats, all covered with multi-coloured glass beadwork in blue, red and yellow. With a beaded crown on the crest rail, a red and yellow knot design on the straight splat between blue and red tassels, further tassels on the seat, diamond patterns on the arms and legs and four lions on the upper surface of the gold beaded seat. Embroidering the beading and creating patterns for beadwork chairs and footstools is an important spiritual exercise for the Yoruba people. The symbolism of the interlaced motifs denotes many aspects of spiritual life - power, the past, the future and respect for ancestors and descendants. Since the eleventh century, the Yoruba people of West Africa have lived in the south-western area of what is now Nigeria and the Republic of Benin. Beadwork and royalty were closely associated in this culture, with vast quantities of beads considered a source of wealth and status. The wealthiest Yoruba kings employed craftspeople to embroider their clothing and other objects, and these ornately-decorated pieces became an important part of their regalia. Many of the colours and symbols applied in decorative beadwork hold spiritual meanings, and the recurring patterns of triangles and zigzags are designed to create visual tension and movement.